An adult dog that pulls and barks on his leash can be frustrating and difficult to handle. Often the barking is due to social inadequacy, frustration or a mixture of both. If socialization is not carried out properly from puppyhood a dog can develop fear based problems. The worried dog will become anxious or agitated very quickly. Either as a form of defense or simply because he doesn’t know what else to do, this can result in your dog barking. Dogs learn a lot about the world in the first few months of their lives. If this crucial time is not utilized properly a dog can become socially awkward at best and terrified of things in the worst case. Some dogs in shelters and rescue care have missed out on this social learning and can be difficult to rehome because of it. Dog barking can seem random and unprovoked, but it is not. The dog that has worked himself up to a barking frenzy has gone through a range of feelings before arriving at the option to bark. The behavior may be established and need lots of work, but it can be improved. If you have an adult dog barking on the end of a leash you must first work out the stimulus. What is the trigger to your dog barking? If it seems to be everything do not despair the behavior can be modified it will just take consistency. There are steps that you can take to teach your dog that barking is not the best option. Take your dog into a very quiet area with little stimulus and simply watch him. He should hopefully appear quite relaxed. Observe his behavior and reward the relaxation with treats and gently praise his quietness. Then simply wait, and watch your dog whilst he looks around until something appears that may start your dog barking. It is vitally important here, that you start to recognize when your dog begins to become aroused by the stimulus. His head will lift slightly and he will focus directly on the stimulus, he will then stop responding to your voice. A low growl may follow as a prelude to your dog barking. By this point it is too late to intervene in the behavior. You cannot train a dog that is so aroused by a trigger that he has lost complete awareness of you. So don’t try, just take him away from the situation. The point of this exercise is for you to learn where to begin the training session and to recognize your dog’s point of arousal. There is absolutely no point to taking your dog into a situation where he feels that he needs to bark and then asking him to stop. By flooding the dog with stimulus you will be teaching him to ignore your voice and attempts to calm him. Begin by rewarding relaxation in your dog. Watch his body language; if he is relaxed reward it. Take him back to a quiet area and this time your task is to avoid your dog barking. So observe him carefully and continue to treat relaxed behavior. If something comes into the area that may cause a bark reaction then it is up to you to keep him relaxed with your treats and calm words. The trick here is to reinforce the behavior that you would like to establish in place of your dog barking. Do this by reward and if your dog is showing even the smallest focus on the trigger simply put more distance between you and it. Walk your dog away far enough from the trigger that he can relax. By doing this you are teaching relaxation and with this method carried out consistently you will be able to get closer to stimulus as you progress. 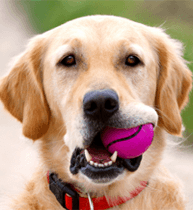 Vary your training treats to keep the dogs interest and always reward him for looking towards you whilst you are out. When he sees a trigger and looks directly towards you he is reassuring himself and looking for a treat. Reward with a treat and he will repeat the behavior. 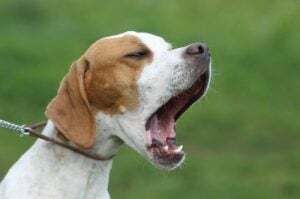 Remember that dog training doesn’t always run smoothly and there will be times that you don’t catch your dog quickly enough to prevent your dog barking. If this does happen just create a distance, take a deep breath, wait for your dog to relax and start again.